Credit: Ernst Lengyel et al. In the September 20, 2018 issue of the biomedical journal Cell, research teams from the University of Chicago Medicine; the Max Plank Institute of Biochemistry in Martinsried/ Munich, Germany; and the Novo Nordisk Foundation Center for Protein Research in Copenhagen, Denmark, identify an independent prognostic factor — cancer/testis antigen 45 – and began to elucidate it's actions. "We believe this is the first example of mass spectrometry-based proteomics leading to the discovery of a prognostic and functionally important cancer biomarker," said co-lead author Ernst Lengyel, MD, PhD, an ovarian cancer specialist and chairman of the Department of Obstetrics and Gynecology at the University of Chicago. "Our goal was to find "reliable biomarkers that could predict treatment response," said the study's co-lead-author Matthias Mann, PhD, chairman at the Max-Planck Institute. The team quantified more than 9,000 proteins and "identified CT45 as an independent prognostic factor for patients with high-grade serous ovarian cancer." "Using mass spectrometry, we can identify, for the first time, almost all of the proteins in the tumor tissue of the patients," Mann said. "Our highly sensitive methods now enable us to profile thousands of proteins simultaneously, allowing us to search for the proteins that are critical to the disease by comparing the tissue samples." So it was encouraging for the research team to find the first significant biomarker in tissues from ovarian cancer patients who responded to platinum-based chemotherapy. "CT45," Lengyel said, "was completely unknown until then." A larger study, using sequence data from The Cancer Genome Atlas, confirmed their initial results, leading to their conclusion that "CT45 expression is a novel prognostic indicator for advanced stage high grade serous ovarian cancer." 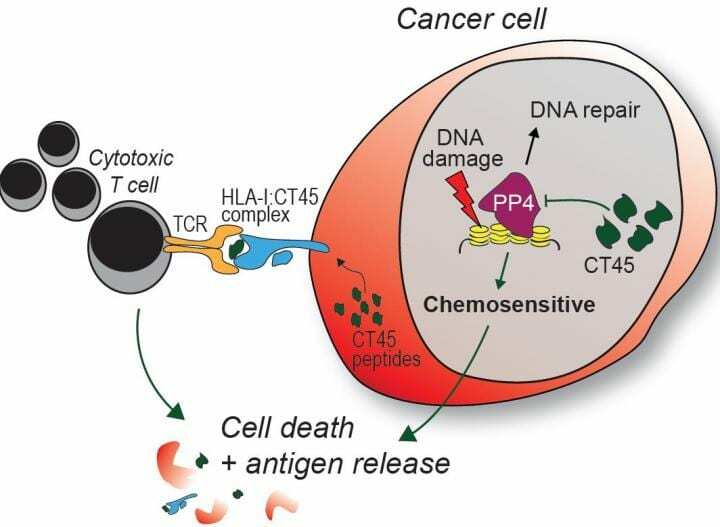 Since little was known about CT45's role in cellular functions, the study authors tried to understand the molecular mechanisms that improved responses to chemotherapy. They found that the standard chemotherapy for ovarian cancer, carboplatin, caused DNA damage, particularly in tumor cells expressing high levels of CT45. This lead to cell death in tissue culture and tumor reduction in treated mice. "We suspect that CT45 plays a major role in the response of tumors to carboplatin. This gives us hope that future strategies that activate CT45 expression in the tumor could make it more sensitive to carboplatin treatment," said Marion Curtis, PhD, a postdoctoral scholar in the Lengyel laboratory. They also found two peptides from CT45-positive ovarian cancer cells that stimulated a solid immune response against the cancer. T cells collected from a CT45-positive patient with high-grade ovarian cancer were able to kill cancer cells in vitro "in a dose-dependent manner." "We have evidence that tumor-specific expression of CT45 stimulates the patient's immune system to fight the cancer, as would a virus or bacterial-infected cells," Lengyel added. "Our long-term goal is to find new ways to improve patient outcomes based on these exciting insights." The clinical implications from this study "could be significant," the authors note. Expression of CT45 improves the efficacy of platinum-based chemotherapy, and potentially immunotherapy, for patients with advance stage ovarian cancer. "CT45 may be particularly relevant to long-term survival," they added. "This study," they conclude, also "highlights the power of clinical cancer proteomics to identify targets for chemo- and immunotherapy, define their mechanisms and contribute to the development of effective cancer therapies."